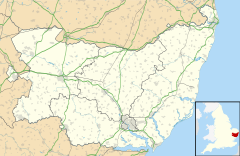 Akenham is a village and civil parish in the Mid Suffolk district of Suffolk in Eastern England. Located on the northwestern edge of Ipswich, in 2005 it had an estimated population of 60. At the 2011 Census the population remained less than 100 and was included in the civil parish of Whitton. Romano-British pottery has been unearthed in fields across the parish. A Middle Saxon gilded bronze pendant or brooch has also been found. A silver penny of the Saxon king Aethelred II was also found nearby. It was known as Acheham in the Domesday Book. Its place name is possibly derived from Old English - 'homestead of a man called Aca'. The abandoned St. Mary's church suffered bomb damage during World War II and is maintained by the organisation Friends of Friendless Churches. The church was the scene of one of the great ecclesiastical scandals of the 19th century, which occupied the national press for a year or more, which reached the high court, and which ultimately led to the Burial Laws Amendment Act 1880. Rise Hall near the church is a late Georgian building on the site of an ancient manor house, formerly the residence of the Le Ruse or Rous family in the 13th century. To the south of Rise Hall here is a small moated site with a central island 14.0m across and 0.3m high. The ditch is water-filled on the W side and parts of the N and S sides; the remainder is merely marshy. There are traces of a causeway in the middle of the E side. On the lower W side there are small fragments of a probable retaining wall for the moat. The site lies just S of Rise Hall and it is likely that this moat accommodated a timber-framed dovecote. This could be a precursor site for Rise Hall. A moat might protect the dovecot from poachers but would be expensive to build and maintain. On the other hand, reusing an existing moat would make sense. The mound is small and there is no attached bailey, Rise Hall being about 50m to the north, in an oval enclosure partly defined by ponds. Mottes slightly separate from baileys do occasionally occur but make no sense as defensive features. A pair of 6th-century cruciform brooches were found ante 1911 at Akenham Hall, which possibly indicates an inhumation site. There are a few small businesses operating out of former agricultural buildings, including Stealth Electronics, which specialises in security equipment, based at Akenham Hall Farm. Chives Montessori School is located in the parish. The school was established 14 years ago and is very much a community school serving local needs. The parish is bordered by the parish of Whitton to the south, Claydon to the west, Henley to the north and Westerfield to the east. Mel Birch. Suffolk Parish Churches. Castell Publishing. ISBN 0-948134-48-8. ^ "Suffolk Churches". Suffolk Churches. Retrieved 2015-03-04.